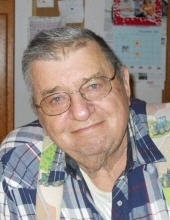 Gerald Johnson passed away on January 27 at the Gundersen Harmony Care Center in Harmony. Gerald Merlin Johnson was born on July 14, 1937 in rural Harmony, Minnesota to Howard Ellsworth and Odella Kathryn (Christianson) Johnson. He was baptized on Oct 31, 1937, and confirmed on September 14, 1952, both at Greenfield Lutheran Church in Harmony. Gerald graduated from Harmony High School in 1956. After high school, he worked doing general farm labor for several years. After Gerald retired from farming, he worked for HECO for thirteen years. In 1963, Gerald married Katha Kiehne. The marriage ended eleven years later. On Sept 2, 1978 he married Judy Marlow. Together they had one son. Gerald enjoyed fishing and horses. He bowled in a league for 13 years. He was a long-time member of Greenfield Lutheran. Gerald loved to play cards, shake dice and collect toy tractors. Gerald was preceded in death by his parents, and by his wife Judy who died in 2013. He is survived by one step-daughter, Lorrie (Scott Trouten) of Harmony, and a step-son, Alan (Pat) Klompenhower of Dayton, Texas, and by a son, Scott (Susan) Johnson of Rochester, two grandchildren: Hope Marlow of Stewartville, MN and Jessica Lemelle of Liberty, TX; and 2 great-grandchildren: Mason and Tripp. He is also survived by three siblings: Carlyle (Katha) Johnson of Pine Island, Richard (Norma) Johnson of Wykoff, and Katherine (Roy) Christenson); a brother-in-law, Richard Marlow of Decorah; and an aunt, Irene (Christiansen) Rice of Harmony and many nieces and nephews. Gerald’s family wishes to thank all his friends, family and caregivers at Gundersen Harmony Care Center and Hospice. "Email Address" would like to share the life celebration of Gerald M Johnson. Click on the "link" to go to share a favorite memory or leave a condolence message for the family.